If you have sore feet, ankles, knee pain, hip pain, rheumatoid arthritis, weak ankles and feet, spine pain, back pain, sciatica, digestive issues, stress, anxiety, depression, pain in your hands and wrist joints, carpal tunnel syndrome, spend hours a day on keyboards and smartphones, poor circulation in your legs, your elbows, frozen shoulder, spend a lot of time driving, stiff and painful shoulders, stiff and painful neck, experience tension headaches, weak immune system, heart problems or high blood pressure, this rather simple myofascial yoga series for all the joints of your body will be extraordinarily helpful. This series of short yoga classes focuses on all the joints of the body: Toes Feet and Ankles, Knees, Hips, Spine, Hands and Wrists, Elbows, Shoulders and Neck, restorating their natural range of motion and mobility. By moving the joints through their natural range of motion, synovial fluid is drawn into the joints, improving circulation and the lubrication of the joints. The movements in this series revitalizes the joints and the tissues surrounding the joints, protecting them from degeneration due to excessive pressure, friction and insufficient lubrication. These movements are excellent for the treatment of rheumatoid arthritis. There is no weight bearing in any of these yoga movements. The series helps to improve the circulation of blood and lymph in the body. As a result there is an improved immune function. In addition this series is excellent for people with heart problems and high blood pressure. 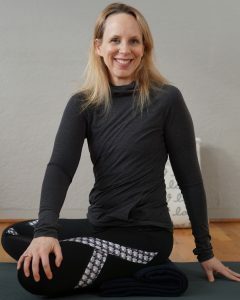 These 8 short videos offers myofascial release yoga with a soft squash ball, soft foam roller or your own hands. Myo means muscle and fascia refers to the network of connective tissue that surrounds and includes your muscle. The fascial tissues get misaligned due to trauma, injury, poor movement patterns and emotional stress. Fascia is a system of proprioception. Fascia is rich in nerve endings, so it creates a direct pathway for nerve signals to flow to and from the brain which aids in proprioception, coordination and our ability to control our movements. In this series of videos we will use a soft squash ball, soft foam roller or our own hands to isolate the fascia throughout your body allowing you to create a neurophysiological response that will enable more range of motion in your joints as well as greater ease of movement and less pain. The soft squash ball is a myofascial release tool that approximates the pressure that you could expect from a massage therapist’s thumb. The soft foam roller is a myofascial release tool that allows you to take your soft tissue care or myofascial release into your own hands. In the final video we will literally use your own hands for self-myofascial release. Because seeing a registered massage therapist regularly is expensive, regular use of a soft squash ball, a soft foam roller or your very own hands is an affordable alternative and offers many of the same benefits of the myofascial release provided by therapeutic massage. Using the soft squash ball, soft foam roller or your own hands to stimulate myofascial release creates a neuro-physiological response. The myofascial release influences your nervous system which actually governs the baseline tone of your muscle. Because your fascial system is rich in nerve endings, the gentle pressure on fascia communicates that there is no longer need for tension in that area. In the case of these classes, the myofascial release using the soft squash ball, soft foam roller and your own hands creates a neurological response that allows you to have greater range of motion in your joints, experience greater ease during movement and less pain. 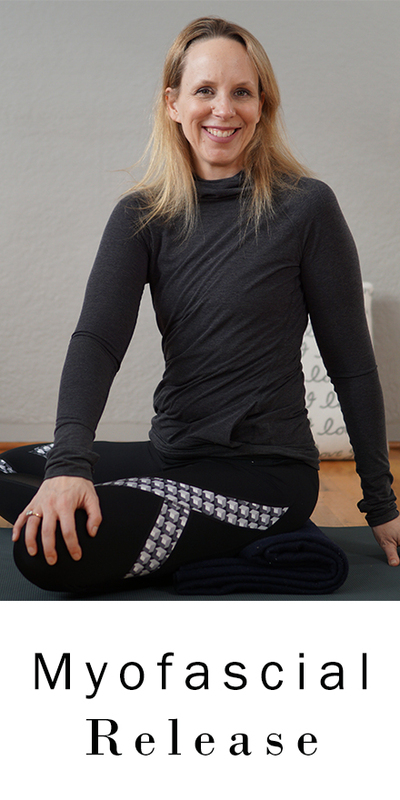 To unlock all eight classes in this series of 8 myofascial release yoga videos for all the joints of your body (including toes, feet and ankles, knees, hips, hands and wrists, elbows, shoulders and neck) join our membership community by clicking here.